Shirdi Sai Baba Stories,Leelas and Teachings. : Ram Vijaya-Chapter 40. Here is chapter-40 from the book Ram Vijaya. Readers who have missed out any chapter can read them by clicking on the link provided below this chapter . Jai Sai Ram. In the mean-time, Vibhishan went to fight with his brother, when the latter said, " You are a great scoundrel. Do you know who I am ? I am your brother. You are treacherous, and have joined our enemies. I should have just killed you on this spot, but as there will be no one left be hind us to perform our funeral ceremonies, I spare your life and command you to leave this place immediately. Do not show me your face again." Having heard these words from the mouth of Kumbhakarna, Vibhishan immediately disappeared. Kumbhakarna then rushed upon Rama, when the latter let off arrows at him, but they all were devoured by the demon. Lastly the prince discharged a deadly arrow at him and cut off his hands with it, and, with other arrows, his feet, trunk, and head. On receiving the news of the fall of Kumbhakarna in the field Ravana much grieved for him, when Indrajit came and consoled his father . 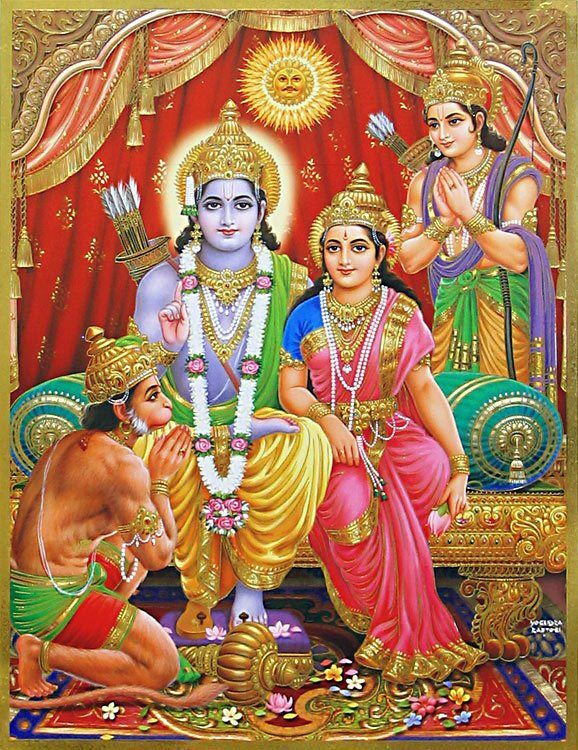 Immediately after, Atikaya, the second son of Ravana, with other warriors, abravely attacked the army of Rama and shot a great number of the monkeys ; but at last Lakshuman killed him with his arrow. Ravana much lamented for him, when Indrajit consoled his father and, having washed his body with the blood of human beings and cows, performed a penance. His goddess was pleased with him and presented him with a chariot, horses and weapons. He seated himself in that chariot and jumped into the sky j and having hid himself in the clouds, he let off arrows at the monkeys and killed them all. 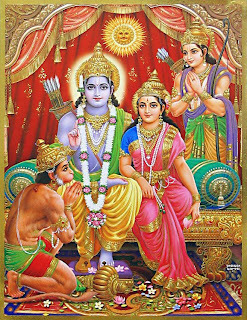 Even Rama and Lakshuman were struck with his arrows. The demon- prince again returned to Lanka with success. To resuscitate the monkeys, Maruti went to get a mountain called Dronagiri, which was full of medicinal plants. For some time he stood at the foot of the mountain entreating him to accompany him to Suvela, the place of the war, and resuscitate the monkeys with his medicinal plants. The mountain said " Be gone. You, fool. I am not expected to accompany you to Suvela. Depart from this place. Maruti got indignant at the insolence of the mountain and, having lifted him up with his tail, brought him to Suvela. By the odour of the medicinal plants on the mountain all the monkeys with Rama and Lakshuman were resuscitated. And soon after, they entered Lanka and set fire to it. Whereupon Ravana sent the demons, Jang Prachang, Krochen, Nikuinbha and others to oppose them and quench the fire. The demons let off a rain-weapon, which produced water and quenched the fire. By his mantra Indrajit then created a female called Kritya and jumped with her into the sky; and hiding him self behind her back he let off arrows at the monkeys and killed many of them, when Rama, at the suggestion of the wind, let off the weapon called Angirastra, which cut off the female. Whereupon Indrajit immediately came down and, having defeated the army of Rama with heavy loss, returned to Lanka with success. The monkeys were alarmed, when Maruti immediately kept the field.